Out The Door is the popular offshoot of San Francisco’s renown restaurant, Slanted Door. With a gorgeous new location in the heart of the Fillmore neighborhood, Out The Door is upping the ante. 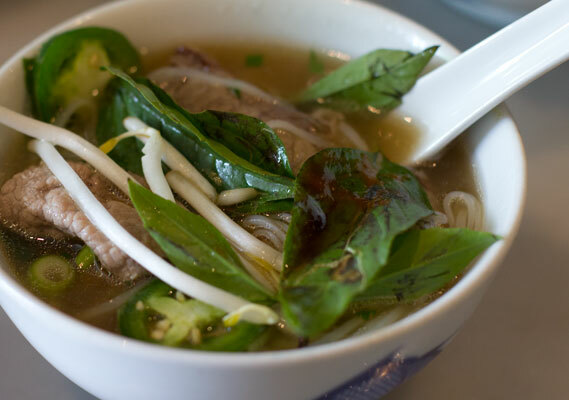 Their original to-go style cafés located in the ferry building and Westfield shopping plaza offer excellent gluten free friendly Vietnamese noodle dishes, spring rolls, and rice bowls that boast organic, local ingredients. With Out The Door’s newly opened restaurant location, you can find inspired variations on those tasty takeout dishes in a more elegant setting. For the gluten free crowd, their wait staff is knowledgeable about which dishes are safe (at the ferry building location they have a list of menu items that contain common allergens). Our waiter directed us to the beef pho and five spice chicken dish, served with thin rice noodles (had to be modified to be gf by omitting a soy sauce marinade). Both meals were exceptionally flavorful, in part because of their seasonal, fresh ingredients. 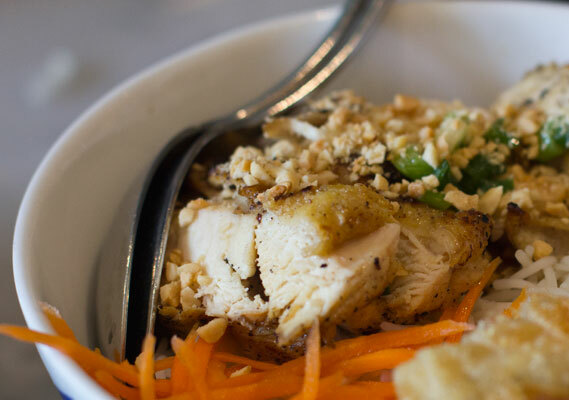 For any trained gluten intolerant eater, you know that finding great Vietnamese food can sometimes be a challenge due to the common use of commercial soy sauce and hoisin sauce (both contain wheat). With restaurants like Out The Door, gluten free folk aren’t left with a plate of plain rice and steamed vegetables. Instead, we can share in the fun of slurping down a bowl of spicy noodles with all of the traditional flavors intact. 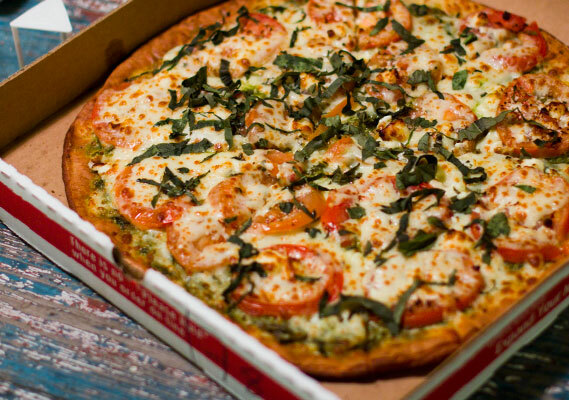 When was the last time you had really good pizza delivered to your door step? Yeah, I didn’t think so. At select locations, Extreme Pizza serves Still Riding 12″ gluten free pizza crust, and it’s the best I’ve tried in the city. If your unfamiliar with Still Riding Pizza, definitely take a look at their website, they supply gluten free New York style pizza crusts to hundreds of restaurants across the country. Still Riding Pizza educates new clients about cross contamination while setting up safe kitchen practices to ensure their 100% GF crust remains that way. If your house does not fall within Extreme Pizza’s delivery zone, enjoy your crisp gluten free crust in one of their many locations in the bay area. Pictured above is their pizza titled “Green with Envy,” topped with homemade pesto sauce, fresh tomatoes, feta, mozzarella and basil. 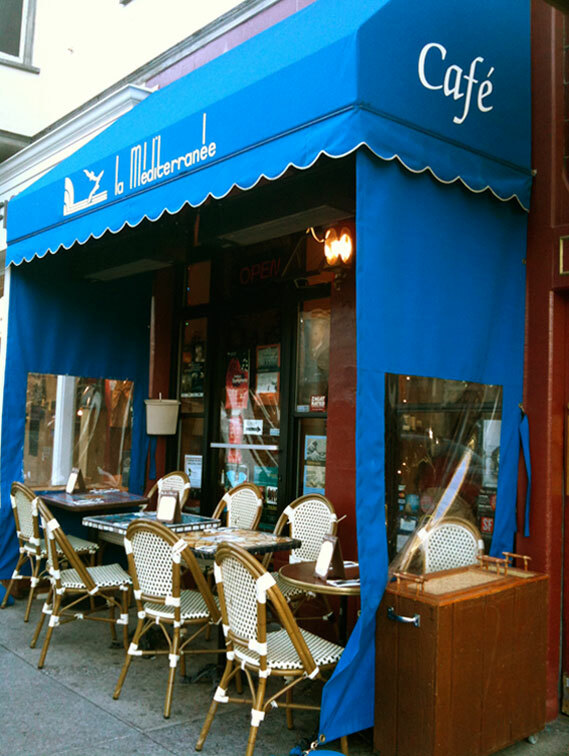 For an authentic Mediterranean meal with a cozy, warm atmosphere, try Cafe La Mediteranee on Fillmore Street. Although they have 3 locations in the Bay Area that will accommodate gf customers, their Fillmore St. location is the only spot that provides a gluten free menu. A multitude of exceptional gluten free options include items like kebabs, soups, and an Armenian potato salad, which is not to be missed. For the main course, “Chicken Pomegranate” is an absolute must. Served atop perfectly spiced rice pilaf with hummus and fresh greens, the 4 chicken drumsticks have been marinated to perfection in a tangy, delicious sauce that will leave you craving it days after the fact. For dessert, try the Crème Brulee. *Please note: Although their menus are virtually identical, the ingredients vary at each location so please check with your server.